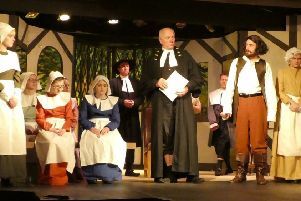 Leo Emmerson, left, in Ponteland Repertory Society's production of The Wind in the Willlows. Ponteland Repertory Society’s latest production, their take on Alan Bennett’s adaptation of the Kenneth Grahame classic The Wind in the Willows, has proved a springboard to success for one of its cast. Leo Emmerson, cast in the leading role of Toad, has landed a place at the Italia Conti Academy of Theatre Arts in London, starting in September, and is hoping to carve out a career on the stage afterwards. Society stalwart Lesley Eltringham said she and colleagues were pleased by the reception given to the show’s four-day run at Merton Hall in Ponteland earlier this month. “We were delighted to welcome many familiar faces to the cast – Joe Costigan as Mole, Brian Barry as Badger and Leo Emmerson as Toad,” she said. “Jonny Woollett, who was a wonderful Fagin in our last production of Oliver! played Ratty in this production but also, amazingly, directed the play, with the assistance of Lucy Walton. “This was their first opportunity to direct, and we were happy to encourage young talent to spread their wings and take on this challenging task. “They enjoyed the support of an excellent cast and production team, who work so hard behind the scenes and without whom our productions could not take place. “Once again it was wonderful to see our youth theatre group, Preppies, taking a full part in another production and gaining valuable experience, developing our future stars. “We are so proud that our young actor Leo has gained a place at the Italia Conti Academy of Theatre Arts. “We will miss him, but he is such a talented young actor that we wish him all success in a no-doubt glittering career in acting. “Once again, our audiences have supported us with their presence and applause. We thank them for all the kind words and appreciation we received after performances. The Wind in the Willows, published in 1908, is the story of the adventures of a group of animals, including Toad, Mole, Rat and Badger. It was in its 31st printing when Winnie-the-Pooh creator Alan Alexander Milne adapted part of it for the stage as Toad of Toad Hall in 1929, and that version was further adapted by playwright Bennett, 81, in 1991. For further details, nearer the time, of the society’s forthcoming panto, go to www.